An array of .03 chairs are spotted in a McDonald’s restaurant and disseminated through one of today’s most popular social media sites: Twitter. Feeling the need to ‘tweet’ about the .03 at 2.52 in the morning, one user posted, “Van severen chairs in mcdonalds stockholm.”  Of course, such a Tweet is utterly meaningless without an Instagram photograph attached to it, so therein lies the proof: it sits there in the image, completely at ease, in an utterly profane environment. It becomes an utterly profane environment. It is as if it descended from Olympus to sit among mortals. High design becomes flesh, becomes utility, becomes chair, becomes a piece of furniture in a hamburger restaurant. It will still be there to accommodate you when you return from your night out, having had too much to drink and craving a ration of greasy late-night calories (fig. 1). In such a setting, the .03 becomes an animate object, projected upon as if it is more than just a thing but an object with a nightlife. When we think about the “ordinary” objects that surround us, by and large we consider tools and appliances. Lamps, chairs, and tables are objects that blend into the environment largely unnoticed. They are used; they are presumed functional by nature. The moment such objects are perceived as artistic or aesthetic however, their significance shifts. The utility of the object becomes secondary and attention is mainly drawn to the object’s physical form and the circumstances of its production. In the case of the .03 chair, thrust into the spotlight on one hand and widely distributed on the other, the position it occupies between an object of use and a work of art is tenuous. This article will describe the different forms of agency and the varying settings in which the .03 chairs appear. In so doing, the object will be considered not as singular, but as a thing with inherent multiplicity. The .03 chair, designed by Maarten van Severen, resides in the middle ground between a “common” and “original” object; it is designed for use, but also perceived and exhibited as an artistic object. An exploration of the ‘agency’ of the .03 chair is ameliorated by previous accounts of the term, most notably by Bruno Latour In We Have Never Been Modern. Latour attempts to overcome the object-subject dichotomy established by philosophers like Kant and Hegel by throwing into question the overarching separation between nature and society, in which the moderns believed, though it has never really existed (Latour, 1993). Today we have many “hybrids” or so-called quasi-objects (like global warming, sensor-equipped robots, deforestation and so on) that blur this distinction between object and subject to the point that it no longer proves fruitful. The need exists to broaden the definition of actors instead to include both objects and subjects. In his publication Reassembling the Social, Latour sets out a methodology for this actor-network theory that takes into account both human and nonhuman agency. He explains, “any thing that does modify a state of affairs by making a difference is an actor, or if it has no figuration yet, an actant” (Latour 2005, p. 71). This type of action is explicitly not limited to human intentionality but is of a more accidental nature. Further arguing for a reconsideration of the strict distinction between objects and subjects, Jane Bennett establishes her theory of “vibrant matter” with regard to the accidental, energetic agency of things (Bennett, 2010). She focuses on situations where things act upon themselves, resisting and re-forming human intentions. Most examples of such confounding elements exist without a determined shape or form, like electricity or waste, but with societal impact. With these elemental forces, it is quite easy to imagine them actively shaping their environment. Here however, I will consider the kinds of agency possessed by objects that at first seem more static than active. I start from the assumption that the object itself has agency, but more importantly that an object is a flexible, dynamic thing which can lead multiple lives at the same time. The presence of the .03 chair within its functional context, as well as its redistribution in the digital realm, serves to illustrate this problem. To begin, I will describe the conditions of the .03 chair’s conceptualization and production. Maarten van Severen’s practice started small in 1986, under the name of Maarten Van Severen Meubelen. (In 2000, the name was changed to “MVS Studio.”) He designed and executed his first pieces himself. The craftsmanship and production process played an important role in these products: Van Severen worked on a single piece for a long time, but the material was cultivated only slightly, leaving it quite rough. Signs of use and aging are quite visible in these products. As early on as 1986, Van Severen constructed the chair CNº I and in the years thereafter, he continued to experiment with chair design alongside the production of bookcases and shelves. The CNº II (sometimes referred to as .02) was realized in 1992 and, already straddling the border between art and design, was well-received in the Belgian art scene. This popularity eventually led Van Severen to establish a relationship with producer Top Mouton (now Aiki) in 1999, at which point the sales of his furniture increased. This had an impact on Van Severen’s practice as a designer. He no longer crafted the designs himself, but instead had them produced elsewhere as part of a standardized process. His studio took on a primarily intellectual function as a space where the designs were thought out, tested, and prototypes were made. However, it was a collaboration with Vitra that brought a serious boom in sales and spread Van Severen’s furniture around the world. Around this time the first catalogue of Van Severen’s work was produced as well, setting the tone for coming publications and contributing to the discourse around his work (Van Severen 2000). The designer’s first meeting with Vitra’s Rolf Fehlbaum dates back to at least 1994, at which point Van Severen was already considering a more industrial production process (Van Severen 2004, p. 37). Preparations for the release of the .03 chair took many years. The goal was to make a chair more comfortable than the CNº II through the technological possibilities offered by Vitra’s specialized staff. When the .03 was released in 1999 it was immediately regarded as a success. While it makes sense that an industrialized process would equate to larger production numbers and sales, this shift alone does not entirely explain the massive popularity of the .03. In part, its success is due to a technological innovation: the combination of polyurethane integral foam and springs makes the chair adaptable to the body of the user, resulting in a higher level of comfort compared to the CNº II. It is notable that it was specifically this step towards industrialized production that made Van Severen famous, even while the discourse around his work focused primarily on the quality of his craftsmanship. 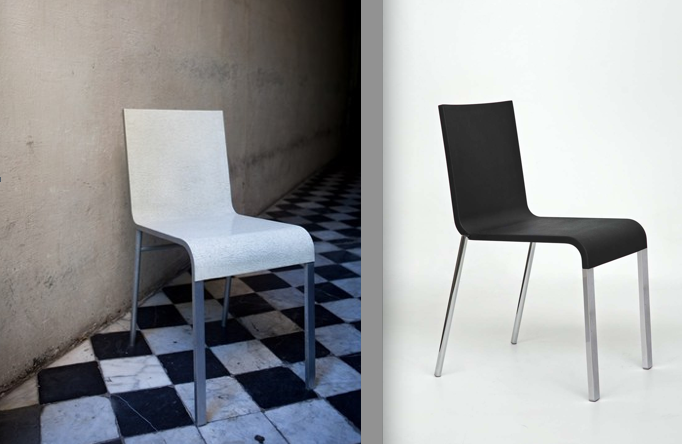 The simplicity in form of the .03 is indicative of earlier designs of the chairs CNº I and II. In this respect, the chair .03 cannot be viewed as separate from the earlier designs but instead should be considered in light of the interactions and associations each of the chairs has established with one another and with other actanta, in keeping with Latour’s understanding of the social as “a type of momentary association which is characterized by the way it gathers together into new shapes” (Latour 2005, p. 65). Other authors have noted that the industrial production method did not make a significant difference in the appearance of the chair, but it did alter the level of comfort (Melis 1999). Yet this is not to say that the .03 is not physically distinguishable from the CNº II, but the strong visual and formal resemblances between the chairs brings to the fore the matter of functionality and aesthetics in relation to each other (fig. 2). This side-by-side comparison reveals how the earlier designs and production processes influenced the .03 made in collaboration with Vitra, and suggests that the final product could have been completely altered if one element in the “network” had behaved differently. The agency of each actant in the network is inherent to how the object has come into being, a factor that plays a role in each context in which the object is featured. In the case of the .03 chair, these contexts are highly variable. For example, the .03 chair is popular in many institutional settings: it can be found at the Van Abbemuseum in Eindhoven, the University Library in Ghent, Kunsthal Rotterdam, Sint-Baafs Cathedral in Ghent, the Centre Pompidou, the University Library in Utrecht, and so on. It seems that especially museums and university libraries – spaces that are related to culture and education – seek this chair for their interiors. This development does not appear to be based purely on functionality, but on the chair’s aesthetic appeal and even its ‘stardom’. According to Vitra Nederland Sales Director Wim de Ruijter, the .03 chair was initially very “exclusive” because of its cost (approximately 425 euro a piece) and aesthetic appeal, but now it is used more broadly as is amply demonstrated in the example of McDonald’s. Some users do not appreciate this commercial use of the chair; they prefer for the chair to maintain its status as Design – exclusive and unique. Yet the chair has undeniably taken on a level of widespread popularity. It is here that the digital realm should be discussed as a tool partly responsible for the proliferation of the image of the chair, and its photographic representation on the internet. The featured chairs in the aforementioned Tweet is just one example of the animate object on the internet. On Maarten van Severen’s personal Facebook page an album entitled ‘Where is chair .03?’, asking users to “Post here your picture of the .03 to see in which different contexts it has been put around the world.”  Asking about the location of the chair creates an image of movability and flexibility, as though there is one chair that can change location whenever it wants, when in reality there are thousands of .03 chairs around the world. The (only) thirteen photographs in the album are all posted by Maarten van Severen himself (i.e. the person managing his Facebook page) since it is not possible to edit another Facebook account holder’s album. Maarten van Severen passed away in 2005 and left his archive to friends and family who established the Maarten van Severen Foundation; the images are most likely sent to the Maarten van Severen Foundation by fans or found elsewhere on the internet. Most of the photographs show the functional use and environment in which the chair is placed: offices and public spaces. One photograph dating back to 2004 however, includes a caption that says “star actor, star architect, star chair.” The photograph features Brad Pitt, Rem Koolhaas, Joshua Ramus and a number of black .03 chairs (fig. 3). Moreover it should be noted that there are also other people in the photograph, yet none of them are named, just to make clear who the important stars in the photograph really are, including the celebrity chair. Producer Vitra (Belgium) even staged a photo contest in March of 2012, in which people could win the latest catalogue of Van Severen’s work by sending in a photograph with an original perspective on the .03 chair. The contest resulted in a collection of carefully arranged photographs. In earlier photographs of Van Severen designs, a certain preference for the aesthetization of the chair can already be detected. Fien Muller, a Belgian photographer, frequently staged and photographed Van Severen’s designs in a mis-en-scène manner. 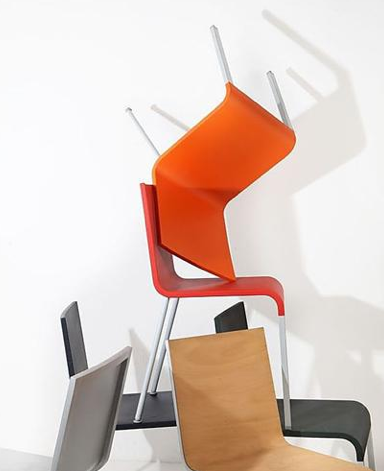 One specific photograph elicits a sculptural quality with several chairs piled on top of one another, arranged in such a way with the lines and colours that it almost looks like a sculpture made of chairs (fig. 4). The photograph can at the same time be seen to emphasize the multiplicity of the chair: a number of chairs are supporting each other or even balancing with one ‘foot’ on the other. Clearly, even in the face of this show of strength, the chair in this photograph is more easily perceived as an artistic object than an object of use. When Van Severen speaks about another of his designs, the library shelves in Van Abbemuseum, he states that their construction should be invisible;one shouldn’t be disturbed by their material composition when accessing the books they hold. Even though a bookshelf does not require physical contact in the way a chair does, this could also be said about the .03: it is extremely functional in nature, and indeed could be regarded nearly invisible because of the simplicity of its form. Yet upon gaining status as a “star chair,” the material form becomes extremely visible. For the chair, intended to be an object of use, its visibility as an actor is a result of its notoriety. This notoriety is again connected to a more aesthetic perception of the chair. Part of the complexity here lies in the discourse around the work; some use-value is lost when a thing receives too much attention. The focus becomes something not inherent to the object, but exterior to it. The chair becomes the idea of the chair. Yet, the .03 chairs will always be used. People will sit on them, touch them, throw them around and maybe break them. An aesthetic understanding could never be enough to either explain or define this kind of object, but neither would a description based merely on its function. The multiple lives of the chair are therefore intertwined and in this sense, many other contexts could be further investigated. This short exploration of the .03 in different contexts offers an insight into how the object exercises agency. The examples are all in their own way related to a certain tension between function and aesthetics. As we can see, leaving aside all aesthetic criteria, it is difficult to determine what is explicitly functional about this object. The idealization and animation of the chair is focused on its function as well as its aesthetic appearance. It might even be said that the .03 could be blamed for the mystification around Van Severen’s practice; such an industrial and commercial product adds to the complexity of this duality in Van Severen’s work. Fig. 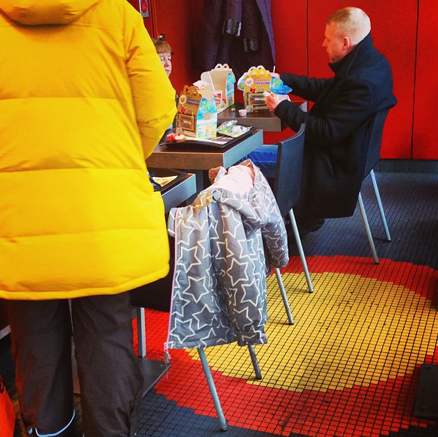 1: Instagram photo of .03 chairs at McDonald’s. Fig. 2: Maarten van Severen, CNº II (copyright The Maarten Van Severen Foundation; photo Fien Muller), and Maarten van Severen, chair .03 (copyright Vitra; photo: Marc Eggimann). Fig. 2: Picture on Facebook captioned “star actor, star architect, star chair” (photo Roel Dijkstra). Fig. 3 Maarten van Severen, A stack of .03 chairs, copyright The Maarten Van Severen Foundation (photo Fien Muller). Bennett, Jane. Vibrant Matter. Durham: Duke University Press, 2010. Latour, Bruno. We Have Never Been Modern. New York: Harvester Wheatsheaf, 1993. Melis, Liebeth. “Werk van Maarten van Severen – Produkten en interieur Villa Floirac.” De Architect 30 (1999) 12, p. 86. Severen, Maarten van. Maarten van Severen. Ghent-Amsterdam: Ludion, 2000. Severen, Maarten van. Maarten van Severen werken | work. Oostkamp: Stichting Kunstboek 2004. Accessed through twitter.com/LouisBruyneel/status/300557850827182080, on 24 August 2013. Examples of this mystification of craftsmanship can be found in the first catalogue in an essay by Geert Bekaert: “our Pygmalion is occupied with each object until it is finished, is fully resigned to itself and has come to life.” (Bekaert in van Severen 2000, p. 76). Even in the following catalogue (2004), Anna Luyten describes the way Van Severen works as perfectionist and artisanal. It should be noted that she regularly quotes Van Severen, making it clear that he himself contributed highly to this image of him and his work. Bennett uses the term assemblage to argue that “an actant never really acts alone. Its efficacy or agency always depends on the collaboration, cooperation or interactive interference of many bodies and forces” (Bennett 2010, p.23). Based on a telephone interview with Wim de Ruijter on June 6, 2013. In the online article “Building the perfect chair,” Kris Lenearts is quoted saying the following about Maarten van Severen: ‘He wanted his chair all over the place. You can put it where you want. It adapts very easily. It keeps its personality.’ The author of this article, Anna Jenkinson, draws the conclusion that people sometimes speak about the chair almost as if it were a human being. She states: “the deceptively simple .03 chair is very much alive.” Accessed through flanderstoday.eu/content/building-perfect-chair on 15 December 2010. See Facebook site. Accessed through: facebook.com/media/set/?set=a.445224925036.381281.321989070036&type=3, on 24 August 2013. See Facebook site. Accessed through: facebook.com/media/set/?set=a.347614655280393.75398.133973889977805&type=3, on 24 August 2013. I am thinking here of a thorough examination of the aesthetic realm and the way in which the object is perceived in the museum, for example in the exhibition De stoel .03 van Maarten Van Severen, or an exploration of the other designs that have come out of the .03. Vitra and Van Severen already developed the .04 (a desk/counter chair) and .05 (cantilever chair), for example. It would be interesting to investigate that afterlife of the object as well. It should be noted that when I started writing this article, I intended to write about a specific object in its physical appearance. Instead, my focus returned continuously to the image of the object rather than the physical object. The image is a reproduction of the object, reproduced through the medium of the internet. My own confusion between these two appearances might tell us something about the way we comprehend things. Most of the time, things are encountered through reproductions, or through reproductions of reproductions. When we speak about a photograph of an object on the internet, what remains of the object’s agency? Is the image distinct from the object? How are the two related? What is the representation of the thing itself, and when does it become a different thing entirely? These are questions that should be investigated further, and the .03 chair is an interesting case in which to do so.